Save time and money when you use Wafer Seals. You can receive significant discounts on your monthly postage for your church newsletter and mailings by following a few guidelines to qualify for automation mailing rates – which can save you almost $0.10 per piece! For items mailed without envelopes, Wafer Seals are the perfect way to seal your newsletter and bulletins being mailed to your church members. 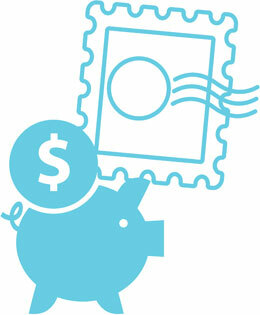 To qualify for special automation mailing postage rates, you'll need to comply with U.S. Postal Service regulations. Most mailed pieces need to be closed with three 1½" Wafer Seals. Staples and mailing tabs with perforation aren't permitted. With Wafer Seals, everyone wins! The U.S. Postal Service doesn't have to worry about its machines jamming, and you can mail newsletters that are easier to open, more attractive and help qualify for bulk mail automation-rate postal discounts. We're also the only Wafer Seal company that ships their seals in a handy dispenser box for easier application and longer storage. Qualify for lower postage rates with Wafer Seals. Any folded self-mailer must follow the USPS’s regulations and be sealed with mailing tabs. The beauty of Wafer Seals is that you can send your newsletters without the additional time and expense of including an envelope and receive lower postal rates than sending your newsletters in the traditional way. What should I know to lower my postal rates using Wafer Seals mailing tabs? Here is an abbreviated summary of the physical characteristics of folded self-mailer. You can see the full list by visiting the USPS website. How do I use Wafer Seals on my mailings? Most folded-self-mailers need to be closed with three 1½" Wafer Seals. The specific number of mailing seals or tabs required is determined by the weight of the mail piece and other design elements. But in general, self-mailers that weigh up to 3 ounces and are bi-fold or tri-fold will require 3 Wafer Seals. Staples and mailing tabs or seals with perforation aren't permitted. Wafer Seals must be tight against the edge of the mailing, with a recommended maximum overhang of 1/16". Seals may not interfere with readability in the barcode "clear zone" and must accept water-based ink if the barcode isn't preprinted. The USPS classifies most church newsletters as booklets. Booklets are defined as having a bound edge. Sheets that are fastened with at least two staples in the manufacturing fold (saddle stitched), perfect bound, pressed-glued, or joined together by another binding method that produces an end where pages are attached together are considered booklets. Booklets are open on three sides before sealing, similar in design to a book. In general, booklets must be uniformly thick. Large bound booklets that are folded for mailing qualify for automation and machinable prices if the final mail piece remains nearly uniform in thickness. Wafer Seals placed on booklets must be at 1½" in width. 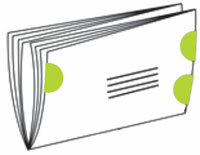 Mailing tabs for booklets cannot contain perforations. As indicated in the diagram below, the fold should go along the bottom, with three Wafer Seals securing the mailing. Place two Wafer Seals on the leading (right) edge and one Wafer Seal on the trailing (left) edge. Position upper Wafer Seals 1" from the top edge and the lower Wafer Seal ½" from the bottom edge. Self-mailers (single folded sheets of 8½" x 11" paper sent without envelopes) should be folded along the bottom, as well. Place one Wafer Seal along the open edge, in the middle. 60-pound Three 1.5" nonperforated tabs Two tabs on leading edge; one tab on trailing edge. Position lower leading tab 0.5" from the bottom edge. Position upper tabs within 1" from the top edge. 5" to 10.5" long 40-pound Three 1.5" nonperforated tabs Two tabs on leading edge; one tab on trailing edge. Position lower leading tab 0.5" from the bottom edge. Position upper tabs within 1" from the top edge. 70-pound Three 1.5" nonperforated tabs Two tabs on top edge; one tab on trailing edge. Position top tabs 1" from left and right edge. Position trailing tab in the middle. Keep Wafer Seals on hand and keep your postage budget in check. Let Wafer Seals help you get the most out of your mailing budget by allowing you to get rid of envelopes and full rate postage fees. Start using Wafer Seals today and watch the savings roll in. Is it time to re-order Wafer Seals?